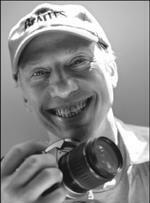 Paul Saltzman is a two-time Emmy Award-winning film and television producer-director. The two documentary feature films, Prom Night in Mississippi, and The Last White Knight, each featuring Morgan Freeman, are his most recent movies. Early in 1968 he learned meditation at the Maharishi Mahesh Yogi’s ashram in Rishikesh, India. While there, he spent time with and photographed the Beatles. His photos have been judged “some of the best intimate shots” ever taken of John, Paul, George and Ringo, and have been seen in galleries worldwide. In 2000, Paul released a book of his photographs, The Beatles in Rishikesh, with Penguin-Putnam; and in 2006 he self-published the deluxe Limited Edition box set, The Beatles in India. Namaste! We are welcomed the traditional Indian way with palms held together. After immigration and custom formalities, we are met and driven to Kovalam. After checking into our hotel, and before dinner, Paul Saltzman will welcome you on this unique and inaugural journey at the Neera Bar outdoor patio. 1. Welcome drink and raffle with Paul. As an added treat, one lucky person will win a draw for Paul’s Deluxe Limited Edition box set (value $875). 1. Night Houseboat on Full Board Basis. 2. Evening Dinner at Taj Lands End. (Pre Set Menu Dinner). Today we tour Udaipur, visiting the City Palace followed by a visit to the world famous Crystal Gallery in the Fateh Prakash Palace. It has been hailed as the single largest private collection of crystal anywhere in the world. It was in 1877 that the Maharaja Sajjan Singh custom ordered this collection from the F&C Osler Co. in Birmingham. It includes a bewildering number of objects d’art, dinner sets, perfume bottles, decanters, glasses, washing bowls and even furniture, including the only crystal bed in the world. Later we visit Saheliyon Ki Bari, or the Garden of Maids; and the folklore museum where we can see a presentation of the string puppet shows traditional to this area. In the afternoon we visit Sajjangarh Fort, the ‘Monsoon Palace’, high above Udaipur, affording a marvelous, panoramic view of the area. 1. City Tour of Udaipur visiting City palace, Crystal Gallery, Saheliyon Ki Bari. 3. Hawa Mahal (Palace of Winds). 4. Dinner at Spice Court Restaurant. 1. Guided tour of Fatehpur Sikri – World Heritage Site. 2. Guided tour of Agra Fort – World Heritage Site. 1. 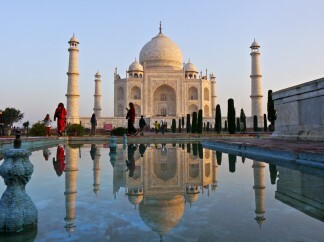 Guided sunrise visit to Taj Mahal – World Heritage Site. 4. ‘The Inner Journey: Fusion of East and West’ with Paul Saltzman. Jama Masjid, in Old Delhi, is the second largest mosque in Asia and the most important in India. A center of Muslim importance, it was built in 1656 by Shah Jehan, builder of the Taj Mahal. The best over-views of Old Delhi are to be seen by climbing the narrow steps to the top observation level of one of its two towering minarets. The gulleys, or narrow pathways of Old Delhi hold the most wonderful specialty markets: spices, gold and silver, wedding saris, antiques and much more. Later we stop for Lunch. After lunch we visit Birla House, the former residence of Mahatma Gandhi, where he spent his later years and where he was assassinated on January 30, 1948. It’s a museum and memorial to the man Nelson Mandela credits as his inspiration to non-violence. 3. Birla House — Residence of Mahatma Gandhi. 2. Visit to Maharishi Mahesh Yogi’s ashram (Subject to permission). 2. ‘Overcoming Life’s Anxieties’ with Paul Saltzman. 3. White water rafting (Not included in cost). 4. Aarti Ceremony at Parmarth Ashram. 5. Tour Certificate Presentation Dinner. NOTE: All daily events are optional for you to participate. At any time you are welcome to just put your feet up or wander the markets and shops. All meetings/recitals are subject to availability.